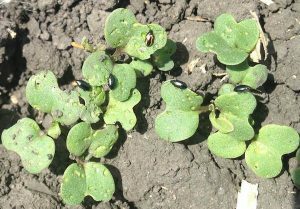 Test your flea beetle knowledge with these five questions. 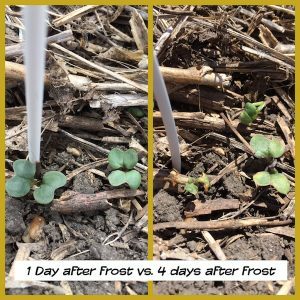 How deep is too deep to seed canola? 1.5” may be as deep as you want to go. 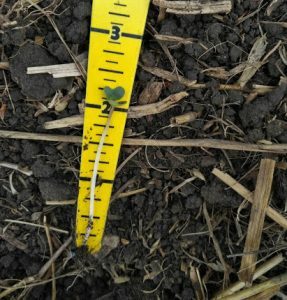 If moisture is at 3”, for example, that is a long way for a small canola seedling to stretch. Generally, small-seeded crops such as canola are more sensitive to seed-placed fertilizer, especially nitrogen and potassium. 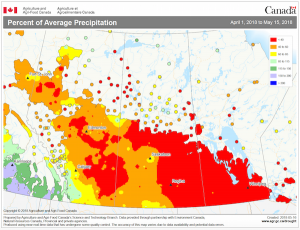 This map shows percent of average precipitation for April 1 to May 16, 2018. Areas in red have less than 40% of average. 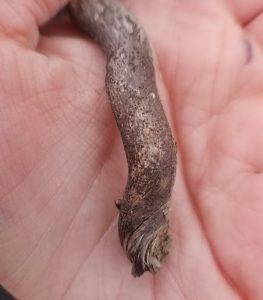 It was too early to do emergence counts, but I did manage to find some blackleg pycnidia on canola residue from 2016. We will have to keep an eye out for the disease this year. Soil erosion poses a significant threat to the sustainability of crop production throughout the world. So next time you take out the tillage equipment, ask yourself why?